Within the ever-colliding stratospheres of fashion and beauty, "rules" have become a bit passé, if not obsolete altogether. Gone are the days when we'd refuse to wear white after Labor Day or dismiss navy and black as an ill-conceived color pairing. Currently, we feel inspired to dye our hair a demurely shocking shade of Chantilly lace or an audacious shade of citrus. A hot-pink, glittering eyelid is cooler than yesteryear's smoked-out cat eye, and we're even experimenting with crystal-studded manicures and taxi cab–inspired polish shades. Our point? It's an exciting time to be in fashion and beauty, and more so than ever before, our hair, makeup, and fashion aesthetic reflect that. Hair, especially, has been the comeback kid of 2019. Previously old-fashioned styles like the French twist have been artistically resurrected, and we currently own more pearl-, tortoiseshell-, and velvet-embellished hair accessories than we did butterflies, banana clips, and comb headbands circa 1999. Impressive. That said, one rule that hasn't changed over the years is the importance (and confidence-boosting power) of having a truly amazing, ultra-flattering haircut. With the right cut, the rest of the hair gamut—color, styling, and accessories—is kind of your oyster. Sure, we 100% condone sporting any kind of haircut that makes you feel like the sh*t, but we also know certain haircuts look especially flattering with certain face shapes, going together like PB&J, Mary-Kate and Ashley, Dolce & Gabbana—you get the idea. To help steer us in the right direction, and since spring is (thank God) a glowing orb of hope sitting in the not-so-distant future, we asked a handful of Hollywood's most talented stylists (you know, the ones who cater to all of our favorite hair-blessed celebrites) which haircuts look best for which face shapes. Oval, diamond, square, heart, round, long, and unique variations between—the shape of our heads can dramatically influence the way certain cuts will flatter and fall. Thankfully, we have the best experts in the biz by our side to help point us in the right direction. Keep scrolling for 20 haircuts strategically suited to every kind of face shape. Don't shoot the messenger, but if you have an oval-shaped face, you can stop reading, head to the salon, and ask for any haircut that tickles your fancy. Kidding—except not really. Every stylist I consulted during my research said those with oval face shapes are the lucky ones who can pretty much sport any type of cut with super-flattering results. That said, since you have quite a bit of freedom, celebrity hairstylist Cash Lawless recommends shifting your strategic focus to favorite facial features rather than your facial shape. "Oval face shapes are often seen as the most balanced face shape with the most symmetry. Therefore, you can get creative," Lawless iterates. "However, here is the caveat. You'll want to find a cut that focuses on features over face shape. I recommend talking to your stylist about your favorite features so you can work together to create a cut that will accentuate those, while simultaneously minimizing anything you don't want to draw attention to." According to Lawless, chic fringe can look great with wide-set eyes, a bold pixie cut can bring out high cheekbones and strong bone structure, and a sleek lob or bob will help draw focus to the center of the face and features like the nose and lips. 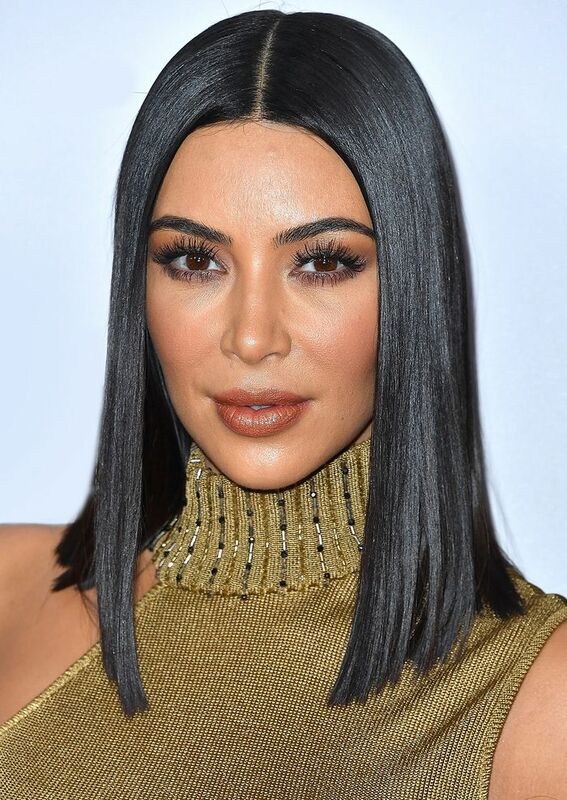 As Lawless points out, Kim's sleek, shorter lob haircut is super striking with her oval face shape and brings attention to her eyes, lips, and nose. Charlize is known for her amazing bone structure, and when she chopped her longer length for a role a few years back, the cut only served to further heighten her amazing cheekbones. "Charlize Theron has historically done a great job with shortcuts when it comes to bringing out her cheekbones," confirms Lawless. Bella Hadid is known for her large, wide-set eyes. If you have an oval face shape like hers and also love to play up your eyes, Lawless recommends taking the plunge and asking for some fringe. Hadid's take is super smooth and polished. Plus, you can wear the rest of your hair shorter (like Hadid) or longer. Whatever you love best. "I always love bangs on an oval face shape!" exclaims celebrity hairstylist Tarryn Feldman. "I just think it's so complementary. That said, if you're worried about the commitment or getting sick of them, I recommend opting for this cut in the fall and winter and letting them grow out for spring and summer." "For an oval face shape, I like a layered, choppy bob, which can be chin-length or more of lob hitting somewhere along the neck but definitely above the shoulders," adds celebrity hairstylist Cervando Maldonado, co-owner of 454 North Salon in West Hollywood. Here, Rihanna demonstrates. Like oval, round face shapes have a lot more versatility haircut-wise than many tend to think. Celebrity hairstylist Justine Marjan loves textured pixie cuts, layered bobs, and side-swept bangs for her round-faced clients, and Maldonado and Lawless add that face-elongating length can also be a strategic route if you're looking to create the illusion of a longer, slimmer-looking face shape. "I love long, sleek haircuts on this face shape with sweeping side parts and volume up at the crown. You don't want your volume to hit at the cheeks or chin," warns Lawless. "Also, be careful of going too short with a round face shape, as it can make the head look wider and out of balance with the neck, especially if you have a thicker hair texture. Queen Latifah and Chrissy Teigen are great examples of a sweeping side part coupled with longer layers. This style cuts across the face and creates the illusion of reducing width." Ginnifer Goodwin will always be one of our favorite pixie-haired actresses in Hollywood and demonstrates the textured haircut Marjan mentioned to a T.
"Pixie cuts look best when blow-dried smooth, especially at the nape of the neck," instructs Marjan. "Use Ouai's Matte Pomade ($24) to control the shape and keep the hair in place." Not quite ready to say goodbye to your strands? Fear not, because stylists say that a layered bob can be equally great for round faces while still allowing you to change up your length. For a shorter, layered cut à la supermodel Miranda Kerr, Marjan says a flat iron (GHD Platinum+ Professional Styler, $249, is her go-to) and a texture spray like this one from Bumble and Bumble will be your go-to products for effortless styling. Simply spray the texturizer through the ends for flawless movement. When it comes to highlighting her signature cheekbones and round face shape, Chrissy Teigen is the ultimate hair muse. We love her sweet, side-swept bangs here, coupled with shoulder-grazing length. "When styling side-swept long layers like Queen Latifah's, use a round brush or curling iron to direct the hair away from the face, giving it a wave that starts at the cheek but not above," Lawless directs. "The closer the hair falls toward the eye, the more balanced the face will appear." When it comes to the best haircuts for heart-shaped faces, stylists say it's all about softening the strong jawline associated with the face shape. "Think layers that hit around the jawbone, wispy fringe, long wispy lobs, etc.," shares Marjan. Maintenance-wise, she says bangs should be trimmed every two to four weeks, and long lengths or lobs should be cut every six to eight weeks." "For this type of face I love a chin-length bob with texture on the ends—not blunt—for a little movement," adds Maldonado. "I also like a long-layered haircut right about the chest with bangs brushing right on the eyebrow which creates flattering, face-framing fringe." "To style a chin-length bob, use Leonor Greyl Au Lotus Volumizing Mousse ($46) from roots to ends on damp hair before first rough-drying then sectioning the hair to blow-dry it with a medium-sized Ibiza boar-bristle brush," Maldonado instructs. "For perfect ends like Kat Graham, dry the ends straighter, and add a bit of texturizing spray to add cool finish and movement." If you have a heart-shaped face, you can opt for long layers with or without bangs, and Felicity Jones (ahem, Maldonado's own client) has worked her signature long longers with both. "Start on damp hair, and add some volumizer to the roots, combing through thoroughly," Maldonado tells us. "Next, you'll start by drying the bangs using a small Ibiza boar-bristle brush, and then you'll section the rest of the hair, blowing out using a large Ibiza boar-bristle brush. You'll want it to be on the straighter side. Once you've finished, you can add Oribe's iconic spray for texture, movement, and light shine." Name a more iconic, wispy-fringe moment than Reese Witherspoon circa 2007. To keep bangs wispy, Marjan advises steering clear of too much product and opting for something lightweight like Tresemmé's Volumizing Dry Shampoo ($6) on your non–wash days to absorb excess oil and keep bangs fresh. "With long face shapes, clients usually have the goal of minimizing length while giving the features more balance and focus," Lawless shares. "I personally love every kind of fringe for long face shapes—side-swept like Liv Tyler or straight and low like Naomi Campbell. That said, I think the ultimate cut for the long face shape is a curly shag with a fringe, which adds width on the side to balance." Lawless says you can also go the route of a lob or longer-length cut that adds volume on the sides—a look A-listers like Sarah Jessica Parker and Carrie Underwood have pretty much made their signature. We're super obsessed with Kelly Rowland's sleek yet playful fringe, complemented by super-long length, but there's definitely some at-home maintenance involved with this look in order to keep it looking polished. "The best advice I can give for a fringe wearer is to ask your stylist for a quick lesson on how to trim after they give you your cut. I recommend getting a pair of thinning shears with as many teeth as you can find on Amazon and start low and slow. Thinning shears are best because they are very forgiving and give the fringe a lived-in look that doesn't look too chunky but soft. You can do it! Just go slow!" "If you're going for a shag, I recommend using a curling wand from T3 to really amp up the curls and volume if you don't have it naturally. Use a smaller-sized wand around the bangs and larger size around the edges and ends," directs Lawless. We're obsessed with T3's mega-handy Whirl Trio Interchangeable Styling Wand Set ($250), which can tackle every single curl goal you and your new cut have in mind. Unless she's wearing her hair up, we rarely see SJP without long, super-voluminous strands. And by concentrating the body on either side of her face, it helps balance out the length. Plus, her layers are perfection and help with embellishing her haircut with piecey-ness and movement. "To style, you'll want to start with damp hair and apply a volumizer like Phyto Actif Volumizing Spray ($30) to roots. Then a little bit of mousse all over to the rest of the head," Maldonado says. "Next, section the hair and concentrate the blow-dry in the top and front sections. Add three Velcro rollers on the top, and as they set, blow out the rest of the hair as usual. Once the hair is dry, pull out the rollers, which adds fullness, shape, and shine. Then turn your head upside down, shake it out, and come back up for the perfect tousled look." To lock it all in with staying power and shine, he recommends spraying strands with Oribe Gold Lust Dry Shampoo ($44) to keep the look intact. "With the combination of a strong jawline and high cheekbones, the goal for diamond-shaped faces is keeping the hair in motion and adding softness," explains celebrity hairstylist Robert Vetica. "This can be done with straight layers or by adding volume with extra wave and curl." Additionally, Marjan adds that diamond-shaped faces look best with cuts that sit around the chin to widen that area of the face, such as A-line or blunt bobs or shoulder-length cuts featuring layers for added fullness. "Diamond-shaped faces also look great with straight-across bangs or side bangs," she adds. "For a haircut that really flatters diamond face shapes, you want to avoid creating too much volume at the crown, which will go for your stying too," warns Marjan. "I recommend focusing your volumizing products towards the mid-lengths and the ends instead of at the roots. I love Tresemmé Tres Two Extra Hold Hair Mousse ($6) to add fullness to the hair combined with the GHD Air Professional Air Dryer ($199). Vanessa Hudgens is ever the hair chameleon, but this blunt-cut bob served with bangs manages to encompass two different haircuts both Marjan and Maldonado say work great for diamond face shapes. "If you opt for bangs, styling can become a bit tricky," says Marjan. "Always start your blow-dry with the bangs, as they are harder to control once they've dried. I suggest blow-drying bangs with a small-sized boar-bristle brush. If you have a cowlick, use the brush and the dryer to dry the hair one way then the other, back and forth until the hairline relaxes." Oh, and mind your upkeep! As Marjan tells us, both short cuts and bangs tread a little higher-maintenance since the grow-out will be more noticeable around your face. Therefore, she recommends stopping in to see your stylist for a bang trim every two to four weeks and a cut trim every six to eight weeks. If you're looking for something that's a little less maintenance, go for a shoulder, or just past the shoulder à la J.Lo, haircut featuring lots of body-building layers to add maximum volume. As Marjan explains, a strategic cut like this one will create the illusion of width where diamond faces don't have it. The jury is in, and according to stylists, the most flattering haircuts for those with square-shaped faces will all cater to adding length (which a square craves) in order to elongate. Both Marjan and Maldonado agree strands falling past the shoulders and beyond, fringe hanging extra low (think right atop the cheekbones), and extended swaying layers are all great cuts for those with shorter, wider faces. Marjan is also partial to big curls, side parts, and romantic swept-over bangs. Maldonado cites client Lily Aldridge as the ultimate muse when it comes to this particular haircut for square-shaped faces thanks to her long length and the fact that she has little to no layers. For styling, this cut is pretty low-maintenance, but for a super-glamorous finish, he recommends blowing out damp hair with a round brush (definitely add some shine-giving heat protectant!) before taking strands for a few spins around a curling iron. For extra volume, he'll finish off the look by spritzing a volumizing spray through the lengths of the hair for some extra oomph and texture. Though Rosie Huntington-Whiteley may be rocking a shorter cut these days, when we think of deep, dramatic, super-romantic side parts, her sweeping strands of yesteryear are the first to come to mind. The major side part coupled with the model's long, minimal layers help stretch out the shortened appearance of a squared-off jaw and, according to Marjan, help add some extra softness. "I love styling long hair with GHD's Soft Curl Iron ($199) to add wave and movement around the face especially," she shares. "Try prepping the hair with Ouai Wave Spray ($26) and then blow-drying. When hair is dry, go back in with the curling iron to curl both sides away from the face, leaving the ends straight for a more modern finish." According to Marjan, curly hair types don’t need to get cut as often because of the natural, spiral growth pattern. Usually, she says, you can go in for a trim anywhere between three and six months depending on your curl pattern and hair-growth cycle. However, if you have long waves and layers, you can probably stick it out for eight to 10 weeks in order to maintain the pieces around the face and to help stave off pesky split ends. "To style big bouncy curls like Henson's, prep damp hair with Aveda's Be Curly Curl Enhancer ($25). Then add the diffuser attachment on your hair dryer using the high-heat, low-pressure setting. Take your time with the curls to avoid too much frizz." Next up, the seven pillars of fantastic eyebrows, according to the most sought-after brow artists.